Secretary’s Report: Secretary Larry Smith reported the club had received a flyer from the Salem Barnstormers, Salem New Hampshire. They are having their Annual Auction, Sunday March 19, 2000 1 P.M. – 6 P.M. FMI 1-603-898-9241. TREASURER’S REPORT: Treasurer Ken Mac Donald provided the Treasurer’s report. Jim mentioned that the following day the BAM Club was going to have a No Host - Potluck thermos Winter Flys. Jim said he was sending e-mails to everyone in the BAM (Brunswick Area Modelers) and DSC that wanted to be notified when the No Host - Pot luck thermos Winter Flys would be held this winter. At least one a month is to be planned. Everyone in the DSC is also invited to attend and fly as quests. BAM has a very liberal policy as far as allowing other Club members to fly at their field without having to join their Club. Only restrictions are that the flyer must have AMA insurance and are a member of another Club. 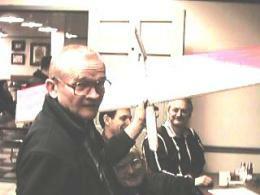 Picture is of BAM/DSC member Sandy Schmidt taking off at the event the day after this meeting. Another one was held on 2/27/00. Both were well attended. As was said in the last newsletter, Rick Hallett had a lot of good ideas on safety so he was coerced into taking the Club Safety Officer position. Rick said he would start a page on glider safety. Something we can use for new members and for old timer refresher training. 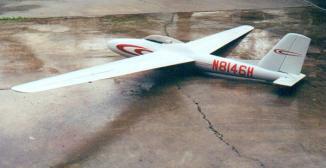 Rick provided 5 copies of another Glider Club’s safety plan. It is provided below for our use to come up with one for our Club. At the January meting it was suggested that we have a safety officer. Prime thought being to point out the areas in which we commonly make safety mistakes. With this in mind I picked this list of rules up from a new Scottish web site. It is hoped that they will spur your interest and thoughts. It is obvious that the flying is different - multiple winches; and some of the sites quite populated- spotter at the slope for landing through the public. It is hoped though that your thoughts will be stirred to think of the common mistakes that we should have on paper for our own review and particularly for new comers. -- Next we need to check to make sure we have a clear frequency. 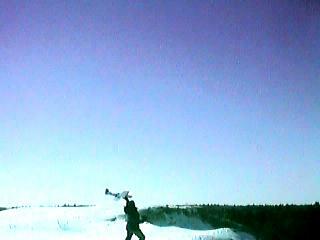 -- The landing areas needs to be designated and in addition at many slope sites the technique must come from instruction from previous flyers. -- If we have problems during flying we need to be very vocal about it so other people in our area can take the necessary safety steps to duck. -- We need to designate the no fly zones - the launch area, the cars, the objecting neighbors, the audience. -- Look after the property- gates litter etc.- it is only our privilege to be there. Now this briefly is how I would summarize what I see in this set. But we started in our thoughts with some of the following. 1. Don't pull back any line with your finger "in" the ring instead pull by the cloth of the chute. Charlie brought us a handle for pulling the monster that we use for the catapult. 2. In addition for this catapult flying it was felt that the launcher if he is holding the plane (that was not really felt to be good) should have safety goggles on. 3. When using the winch the pedal needs to be disengaged if you are working on the line probably better yet the battery. 4. The pedal for the winch should be fluorescent and covered to prevent accidental stepping on the pedal. NOW PLEASE REWORK AND ADD till we come up with all the safety aspects that should be brought to the attention of the new comer. Attempting to be a safety officer. Fife Soarers is a club specifically for the pursuance of silent flight. To ensure the continued availability and use of the Mossmorran and other flying sites, the following guidance notes for members/ fliers and users have been drawn up. The prime aim of the suggestions is to ensure field safety. Accidents can and do happen all to easily so ALL users must follow the codes of practice indicated in this document. The following suggestions for field etiquette have been discussed by active fliers within Fife Soarers. Their implementation is strongly recommended by all participating individuals. All the S.A.A. recommendations for safety must be adhered to with no exceptions. (See S.A.A. safety code). The North most limit for flying from this site is the South side of the A92. Please note that this main thoroughfare is only ¼ mile from the boundaries of the flying site and that an accident on this busy road would be catastrophic. · Ensure frequencies do not clash prior to launch. Check verbally, physically and use the pegboard. 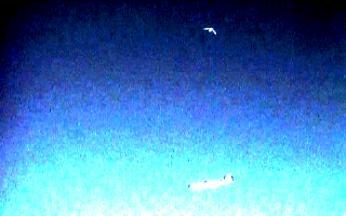 · When more than one pilot/ flier is present, a pre arranged landing area must be decided. This will be dictated by the wind and weather conditions on the day. It is suggested that the landing area should be to the side off the launching area, at least 100 ft clear of the nearest winch. The landing approach area should be clear of all hazards, pilots, parked cars etc. · All landings should be carried out in this area. · The only exceptions being in the case off emergency when there is insufficient time to reach the designated area. users of the problem you are encountering and your imminent landing. · The pit area should not be behind the winches, no matter how convenient this may seem. It should be to the side of the launching area, opposite from the designated landing area. · Ensure adequate spacing between winches. (30 ft minimum). · Ensure that winch lines are not left lying across other members/ fliers’ equipment and lines. · If lines are crossed clear them immediately, either by yourself or ask for assistance. It is your responsibility to clear your line, not other people's. · When group flying ensure that you do not cause an obstruction with your equipment, winch line, towline or bungee, clear the ground immediately so that others may launch and fly at the same time as you. This is your responsibility. · Under no circumstance should any model be flown over areas that have been pre-designated for car parking, spectating or general public access. Whilst this may be difficult to ensure, prior consideration to the positioning of these areas should be given by the pilot. · Under no circumstance should any pilot overly or circle in the winch/ launching area. · Under no circumstance should any pilot endanger other users by flying low around other transmitters/ pilots or other members of the public who may be present. · No vehicles allowed into the field. · No vehicular access will be allowed in to the field, either for delivery or pick up of equipment. · Car parking areas to be decided on the day, ensuring clear access to gates/ thoroughfares etc. for the farmer and other land users. · It is vital that we follow the Country Code. · Leave gates as you found them or ask the other users for specific instructions. · Do not climb fences to retrieve lines, models etc. · Use the gates, they are not too far to walk. · Remember we are on someone else's private land, and we wish to keep using it for our own pleasure. · It does not take much thought to ensure our continued usage of the fields, please be considerate to all our needs. · Any member or guest on the field who continually displays unsafe, inconsiderate practices will be dealt with accordingly. · No low passes unless you KNOW it's clear. · If you are flying alone always check round before attempting a landing, make sure it's clear of bodies first. · Before you set off up the hill have a good look round to see that there is not already flying underway, if there is then you must go to check frequencies before you turn on your equipment. · Flying off the very top of East Lomond is for experienced pilots only. Do NOT fly of the top on your own under any circumstances, you really do need a "Spotter" to make sure that the landing area is clear of the public. · Please do tell someone that you are going flying (In case you fall or injure yourself) then at least someone will know roughly where to look for you if you fail to return.
. Please get your input on topics to Rick Hallett (i.e., call 207-487-3958, write 65 Somerset Ave, Pittsfield, ME 04967, or e-mail happl@mint.net,). Previously Club members selected Saturday for Fun Fly and Sunday for the HLG event. Talked about what weekend to schedule them. Only date people said to stay away from was 4 July 2000. Jim is talking with the BAM officers to get permission to use the BAM field for the FUN FLY. Once BAM sets the date for their Powered Plane FF weekend we will be able to select a date. Need to firm up these two dates and send in Sanction paperwork soon. Also Club members wanted NO Host Soaring Lobster festivals to be scheduled a much as possible. Jim said he schedules Soaring Lobster Festivals and summer meetings at Clark Cove when low tide is between 11 AM and 3 PM. 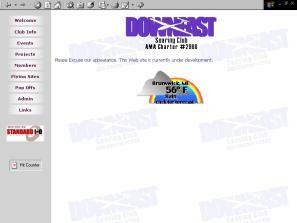 The web sites he has looked at only forecast 6 months in advance. He said he was getting a tide program for his PALM IIIX that will give you the tide for any date selected. Clark cove is great. Treasurer Ken Mac Donald checked his records and reported that the Club had twenty-five paid members for 2000. Historically small groups of past members sign up in the spring and at contests. Forrest Sumner brought a friend, “Brad Danse”, to the meeting. Brad joined the Club. Welcome Brad. Rumor has it that after Brad saw the EPP planes fly at the sandpit he ordered one. Discussed making copies of “Getting Started in RC Soaring”. Printed in the November 1999 issue of RCSD and adding DSC information. The guide covers easy to build and fly RC planes, what radio will likely work best for the beginner (and why), getting started costs, suppliers, sources and additional resources. 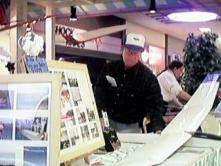 DSC will have a booth at the Maine RC Flight Show. Rick Hallett said that he was already slated to have a table at the show and that he has arranged for DSC to have two tables set at 90 degrees to each other. He is giving a presentation on vacuum bagging. Rick said he would set up a table for DSC beside his table. Previously Rick said he would set up anything (e.g., DSC Sign, applications, Glider brochures, copies of newsletters, picture board, banners) we provided as long as it would fit in the 6 foot body of his truck. Rick need tripods (large or small) to set Gliders on. If anyone has any, please get them to him at the next meeting or at the show. Thanks. After the meeting Jim provided newsletters to pass out/display, newsletter 3 ring binder for display and Club Picture boards. We need to make up banners for booth, copy membership forms, and Glider brochures. Forrest said that he could help with the copying. Phyllis and Forrest said they could probably bring in easels to display Club picture boards. Do we want to set up a VCR? Do we want to sell donated stuff to raise money for DSC? We need to talk more about this event at our next Club meetings. Let Rick know if you can attend one of the two days. Even if you don’t let him know ahead of time, just show up and bring a plane. 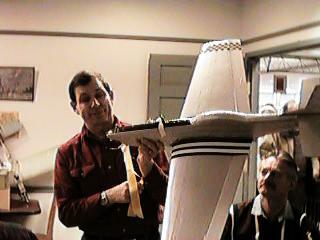 Club members talked about finishing the trainers at the Maine RC flight show. We need to at least finish one and use 2nd glider for parts. IMPORTANT: Bring an airplane and get a free raffle ticket for a new RC radio. You must be present to win. Drawing is on SUNDAY. So be there SUNDAY. Rick Hallett is running this drawing for the KVMA. Also don’t forget to bring something to sell at the swap tables. Also bring cash for the auction on Sunday. You need a Club membership card to sell stuff at the Swap Tables for free. If you didn’t pay for Club badge you can use your address label off of this newsletter. Charlie Kerr read the last newsletter and made a tool for pulling back the line for bungee launches. What you can’t see in the picture is the hook at the end of the wire attached to the wooden handle. You hook the loop on the line and pull back using the handle. Neat! Can’t wait to use it. DSC WEB PAGE: Mike said he need input for Web page content (e.g., Welcome, flying site descriptions, good quality pictures of gliders. JPEG format preferred for pictures and Microsoft word for text. Or send mike URL of picture. Rick can scan pictures. Will be trying to put Club newsletters into Web Page. Mike will be putting information that only Club members can gain access to. There will be a password for Club roster and newsletters. That type of stuff. We discussed what password should be. User & password will be sent out individually to Club members once formally established in the WEB site by Mike. It will be changed every year at time of membership renewal. Anybody having reservation with Membership database let mike know and he will delete their information. 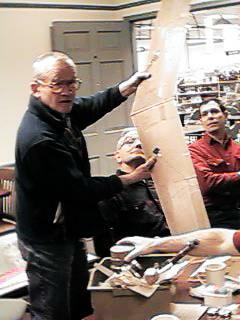 · Ken brought his book for Vintage Sailplanes and Sailplanes by Schweizer a history (new) and copies of the drawing of the automatic foam cutter that he built and the Club has used many times. Let Ken know if you want a copy. · We had a very special guest from Vermont, Mr. Steve Savoie. 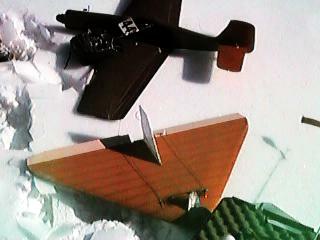 Steve displayed his Dave Aircraft Works P51 EPP Foamie. Steve provided a lot of good information about it. · Steve gave a presentation on his building of his U2. Steve explained the process of building a mold, making the fiberglass fuselage, cutting the foam wings, covering the foam wings and finally successfully flying it. He passed out picture of the U2 building process. It took over a year to complete. One thing Steve said over and over was “I will never make a mold again.” He gave a very comprehensive and interesting presentation. I think we have a speaker that would be great for our 2001 New England R/C Soaring Convention. · Steve is now scratch building a X4. Steve displayed a cover shot and 3 view drawing of it. He showed some of the fuselage CAD drawings he is producing. 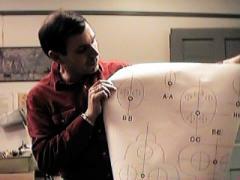 Steve showed X4 drawings and explained how he plans on building the fuselage/wing. 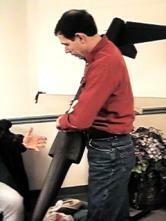 · Rick Hallett brought in several things for Show & Tell. Flying wing without body is Rick’s design. Based on an Eduard Molfino design. · Rick’s flying wing with body is a spin off of the zipper and the mother of Geek. · The Pod & Boom plane in the Contico Gun Case is Rick Hallett’s design. His fuselage is like John O’Sullivan’s rolled boom fuselage. Rick designed the rest of the plane. We should have a new comer this coming month from out of stay moving in about ten or fifteen miles from the BAM field if I understand correctly. He should have landed his family into the house by that time. He has time and place and is looking forward to the event. Too bad I had to go and lose his name in all those people that I replied to this past week. After the meeting a five Club members went slope soaring at the Topsham Sandpit. Steve Savoie flew his DAW P51 and Jim Armstrong flew his DAW ME-109. Larry Smith couldn’t fly his DAW Foam Wulf 109D, because of a battery meltdown. Wish we had Rick to record the events. Forrest and others said they liked Rick’s e-mail on the flying activities. New members Forrest Sumner and Brad Danse liked what they saw and said they were going to order some EPP Planes to get into the fun. I hereby agree to subscribe to the club purpose and shall abide by D.S.C.’s By-laws, Field rules and to the AMA sporting Code. > DRAWING- One ticket each for the next meeting March 11. If the weather is good bring your radio expecting to win and fly. > I am going to give away the second 3m plane that I have completed. You saw the splotchy paint job. AWWW!!! but you saw the first one fly. The second has a stronger fuselage. > The aim of the second unit was to have stiff ailerons and flaps so carbon was added in these areas. Consequently the plane is 6-8 ounces heavier. The intention was to use Harley's RAD system. These will be supplied if you want them. 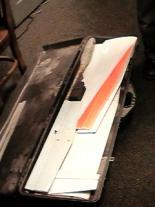 It probably will fly fine on rudder but for the extra performance there is nothing like ailerons and flaps. > The conditions of the giveaway are that I am simply going to take the receiver only out of the plane and pass you the plane without the box. It is now set up for flying with two strong servos mounted in the pod. It will be totally free if you fly it in front of club members sometime this year preferably in addition at one of the contests that I CD If you don't I would like to be paid for the two servos. > Now that ought to add spice to your thoughts of coming to the next meeting.> Rick> PS Shorten and edit Jim as you wish. 9:30 coffee, bagels Muffins etc. · #1 Breakfast starts at 9:30. Meeting will start at 10 AM sharp. Members are encouraged to continue to eat breakfast during the Business portion of the meeting. Meeting must end at 11 AM in Bookland conference room. · Floyd Watts said the Full size glider club that he is a member of would be offering rides at $50.00 a pop come April May time frame. If interested contact Floyd at (207) 589-4344 RR 1 Box 3025 Liberty ME 04949.